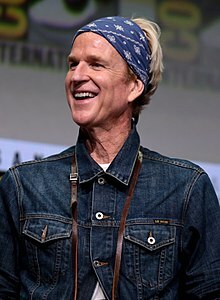 ماتيو مودين (انجليزى:Matthew Modine), اتولد يوم 22 مارس 1959, ده ممثل امريكانى معروف, اشتغل فى المجال الفنى من سنه 1982, وشارك فى عده افلام واللى منها فل ميتال چاكيت. ↑ The Hollywood Interview.com (October 31, 2009). "The Hollywood Interview (2009)". Thehollywoodinterview.blogspot.com. Retrieved January 24, 2012. ↑ "Dark Knight Rises Features Former IB Actor Matthew Modine". patch.com/california/imperialbeach (Imperial Beach Patch). May 31, 2013. Retrieved July 25, 2017.